Jessica is 34, and her mom, Monica, is 63 and has dementia. Nearly 20 percent of Maine's population is 65 and older. According to the Muskie School at the University of Southern Maine, it's a demographic that is growing faster in the state than the national average. And that's expected to increase demand for longterm care, which is already out of reach for many seniors. A state ballot question proposes a solution: provide universal home care for both seniors and people with disabilities, and fund it with a tax surcharge on wealthier Mainers. If approved, it would be the first program of its kind in the country. But opponents call it an ill-conceived idea that over-promises and under-delivers. Jessica Browne's life revolves around her mother; Jessica is 34, and her mom, Monica, is 63 and has dementia. She needs help bathing, toileting, getting dressed, and with meals. One morning at their house, the washing machine is already on its first load of the day, cleaning bedsheets after an accident. This is a 24/7 job, and Browne has had to rearrange her life ever since she brought her mom from Florida to Maine three years ago. She left a new teaching job, and she moved from Searsmont to Belfast to be closer to resources — and schools — so that she can tutor local students part time out of her house. "It really makes a difference that they can come to me, so I can be here and keep an eye on her,” Browne says. Browne says the sale of her mother's condo in Florida and monthly disability payments make it financially possible for her to provide this kind of care, but she worries about how long she can sustain it — economically and emotionally. "I don't even know, honestly, I don’t know if I’m burnt out,” Browne says. "It's like, I’m so tired half the time I don’t know how I feel." "I don't even know, honestly, I don’t know if I’m burnt out,” Browne says. “It's like, I’m so tired half the time I don’t know how I feel. Browne and her mother are the kind of people that Question 1 on the November ballot aims to help. It would create a statewide home care program for seniors and people with disabilities. "We're in a crisis,” says Mike Tipping, a spokesperson for both the Maine People’s Alliance and the offshoot group, Mainers for Homecare, which is leading the effort to pass Question 1. “We’re the oldest state in the country, we're getting older, and there are thousands families that have to make impossible decisions how to care for a loved one," he says. Tipping says the proposal not only guarantees home care for the estimated 27,000 people who would be eligible, it would also increase the home care workforce by boosting pay and allowing them to unionize. "So part of this is about raising wages, it’s about increasing training and accountability, and making sure workers are there for the future,” he says. "And that's going to provide a lot of good jobs in a lot of places in rural Maine." To fund the program, a 3.8 percent tax would be levied on high-income earners. Specifically, those with adjusted gross incomes above the Social Security tax threshold, which is $128,400. That's a major issue for opponents to Question 1. "The new tax that this referendum would impose would make Maine the highest income taxed state in the nation,” says Newell Augur, chair of the group Stop the Scam. 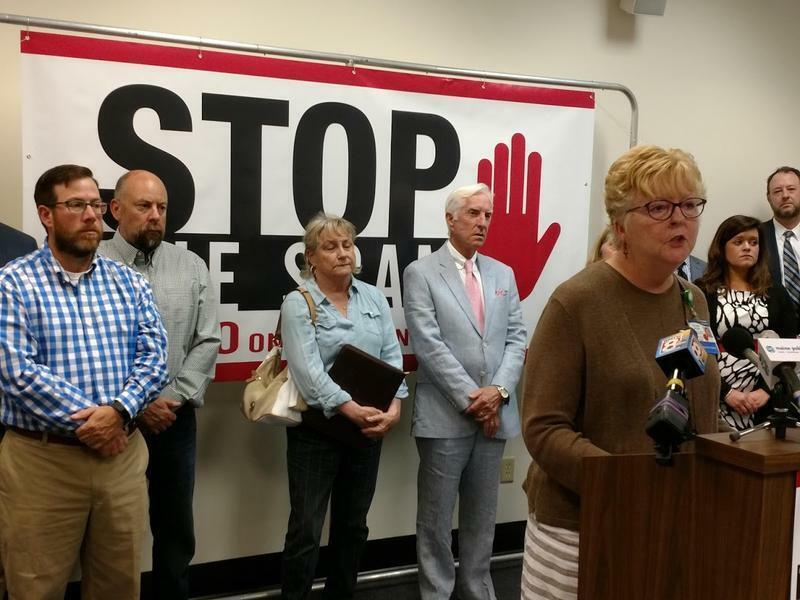 Stop the Scam is a coalition that includes the Home Care and Hospice Alliance of Maine, the Maine Association of Community Service Providers and the Maine State Chamber of Commerce. Augur points out that the universal home care proposal wouldn't tax just individuals who earn more than $128,400. It would also tax families whose combined incomes reach that level, a point that is disputed by supporters of the initiative, but that was recently confirmed by Maine's nonpartisan Office of Fiscal and Program Review. "The idea that we're going to hit 60,000 Maine families and an untold number of small businesses is just going to be a disaster for our economy,” says Augur. Augur says the Stop the Scam coalition is also concerned that the estimated $310 million-per-year raised under that tax structure would be managed by a board that would be both elected and represented by care workers, care agencies, patients and their families. "The state taxpayer, who is funding this, has no voice in how the money is spent,” he says. Money, he says, that would be spent to provide home care for both the rich and poor. Opponents are also raising red flags about a provision that allows patients' contact information to be shared with worker and patient constituent groups, as they campaign to get representatives elected to the board. Gerry Queally is CEO of Spectrum Generations, an aging advocacy group. "We have patient privacy issues that are a concern,” Quelly says. He says it's better to work within the existing state system to expand home care and increase workers' wages, even though the pace of change may seem slow. "It's slow because it's methodical and it's thoughtful, where referendum 1 is neither,” says Quelly. “It's a rush to the end, and when they get to the finish line, they're going to find they've got a lot more problems that they've created than they've solved." But Tipping says, "We have a system right now. It’s a system where people don’t get care they need." No matter what happens on election day, Browne says she hopes that all the attention to the universal home care campaign at least highlights the urgent need for families like hers. Tipping says Question 1 offers a solution because it taps the wealthy to pay their fair share. Patients concerned about privacy, he says, can opt-out of receiving communications about the program. And the fact that the money for the program would be overseen by an independent board versus the legislature is actually a safeguard. "We think it's important that it goes to a trust fund,” says Tipping. “That money meant to help keep seniors in their homes is spent for that, and not for other priorities." Those who are dealing with the issue close to home are wondering what comes next. As her mom gets older, Browne says she worries she won't be able to access help for her care. "I mean these things don’t get better, ya know? It's like there's already has been decline, so I don’t know what’s coming,” she says. “But I just know I don’t want to be left alone with this, ya know? It’s probably the hardest thing I’ve ever done." Originally published Oct. 19, 2018 at 4:22 p.m. ET. According to polls, health care is one of the top issues voters are concerned about this election. Whoever takes the helm as Maine’s next governor will have plenty of challenges to address, from Medicaid expansion and the overall cost of treatment to the opioid crisis and senior care.